They could get Jobs in Sims2. Infact my dogs usually ended up earning me than me...my human characters. I can buy a horse? About damn time. 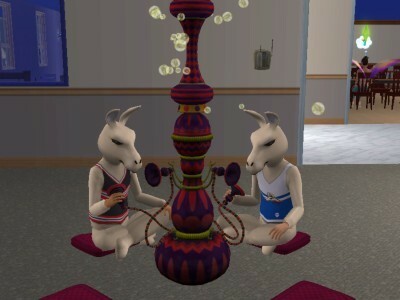 Pets and Nightlife were the best add-ons for Sims 2.
the next couple of minutes i spent looking trough the whole videos of "Boom the ah da" that i could find... weird huh? anyway... what were we talking about? oh! right!!! Actually, in the PC version, there's a cheat you could use in The Sims 2 to make your pets controllable. Go into the cheat entry mode (Shift-Control-C) and enter "boolProp ControlPets on" and you can control your pets. I know, kind of obtuse just to let us control our pets, but it's still a means of doing it. YAY! but I still need to go pick up Generations. i am not sure about the controllable thing. It's never really bothered me that you couldn't. I always saw sims as a way to try and life a life...you can't make your cat do whatever in real life. Now that I hear the option... I am a bit excited about it. It's not what makes or breaks it for me. I think my gf might like this. Can you get a pixie-bob? I've been waiting for Pets since I picked up Sims 3. I enjoyed Pets and University from Sims 2 the most. So...come on Sims 3 University! Must have more Llama references. I am seriously considering repurchasing this on steam just for this expansion (I gave away my discs to my brother). Like the haircuts or do you mean as pets? If haircuts: for people or the pets? My wife is a big fan of the series but she's starting to get sick of the same expansion packs. What they need to do with sims4 is to start it off with Pets, Nightlife, and Businesses (at least) on the launch disc and work on all new expansions and maybe bring back old ones like Making Magic. Now I'm confused.... yet less angry than I usually am this time of day and I want to cuddle something now. It is a pixie-bobs are a breed of cats. Pets again? Yay a reboot, not that I look forward to it in the slightest, sims lost it's appeal to me when I was fourteen. I really feel sorry for anyone whom bought the console versions of this crap. I am so excited. 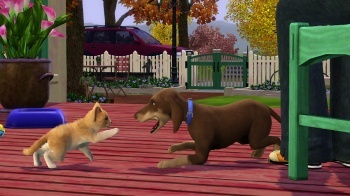 I loved the pet expansion packs of the sims. I can see why many find them boring, but for me they were always a highlight of the sims series. I've been waiting for a pet expansion, now if only I could add weather. I would buy the game and the expansion if i could get a pet space marine. They are just going to keep charging us $40 for the same content as we had in Sims 2. Will the hole game be with kinect or will it just be games for kinect?